Which one-loss team has the best chance to get into the College Football Playoff? Just because you have one loss doesn't mean you're out of the title picture....yet at least. The great thing about college football is the way that, more or less, every game matters. Lose just once and you might have just blown your shot at playing for the national title. Lose twice and you’re definitely not going to play for the title (unless you’re LSU in 2008). Right now, there are still 11 undefeated teams in college football. We all know that’s not going to remain that way forever. Most of these teams either play one another or will get tripped up by an opponent they overlooked or they’ll play their worst game of the season at the most inopportune time. Either way, while it might look like Alabama, Clemson, Notre Dame, and Ohio State have the College Football Playoff on lock, that’s almost certainly not going to shake out that way. Of course, there’s also undefeated squads like West Virginia, UCF, Colorado, and NC State lurking, but most, if not all of them, are going to come down to Earth sooner than later. Believe it or not, the Wolverines’ CFP destiny is still clear, or at least, possible. The loss to Notre Dame looks pretty good right about now and they’ve otherwise taken care of business. However, the fun begins this weekend with a visit to Wisconsin. If they can survive that they have Michigan State lurking next game and then a trip to Happy Valley after that. Of course, the big Ohio State game looms at the end of November. However, if Harbaugh’s squad is able to put it all together, they will not only have won out, but they’ll have dispatched with the teams in their way for a Big Ten Championship bid as well. They’ll likely end up playing either Wisconsin again or Iowa and if they can win that one, they will have made a pretty compelling case for the CFP. Despite the fact that there are three one-loss teams ahead of them, the Sooners actually have the best shot of any of them to make it to the CFP. 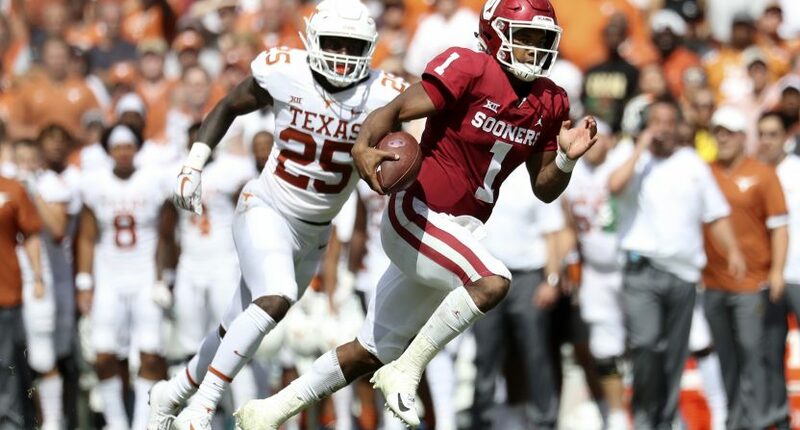 Oklahoma is coming off of a rivalry loss to the Texas Longhorns (who are back! Maybe!) but they might have gotten it out of their system at the perfect time. The schedule ahead certainly has some difficulties (the November 23 showdown with currently undefeated West Virginia could end up being the first of back-to-back meetings between them). However, the Sooners currently have better odds of getting to the Big 12 Championship than Texas (who could also be their opponent again) and probably have the most talent to make it happen. They better hope a couple of those undefeated SEC teams really stumble, however. Hey, remember the Pac-12? The Huskies made waves two seasons ago by crashing the CFP party, only to get rudely ejected by Alabama. They came into this season with high hopes but lost in the opener against Auburn. Still, it was the first game of the season and it was a road game, so if you’re going to lose, that’s the best way to do it. If, and that’s a strong if, the Huskies run the table, they’re going to make a compelling case for a CFP spot. That will include wins over Oregon, Colorado, Washington State, and whoever they beat in the Pac-12 Championship. Like Oklahoma, they’re going to be rooting for a little chaos in the SEC so we’re not looking at two bids there. Even though they just beat Oklahoma, we’re putting the Longhorns just behind them in terms of the likelihood they’ll be able to reach the CFP. Truth be told, we’re still not entirely sold that “Texas is Back!” just yet. They host West Virginia on November 3 and the winner of that game will likely be in the driver’s seat for the Big 12 (for now). The Maryland loss really stings and even with three wins over Oklahoma and West Virginia (including the B12 Championship), it’s gonna be hard to convince anyone Texas deserves a spot over a one-loss SEC team. The Nittany Lions (hopefully) got their worst play-call of the season out of the way in a home loss to Ohio State. You’d rather not lose at home but there’s no better team in the Big Ten to fall to than OSU. November has some really huge games for PSU, including a home game vs. Michigan and visit to Wisconsin in consecutive weeks. They’ll need Ohio State to stumble along the way and hope the SEC doesn’t snag the second bid. Unfortunately for Penn State, all they can do is win-out but that still might not be enough. The Badgers’ loss to BYU isn’t going to do them any favors in the hunt for a CFP spot. It also doesn’t do them any favors to be in the Big Ten West. Their November 10 game against Penn State is the only real marquee matchup left on the docket. That’s good news in that their path to the Big Ten Championship is clear. However, it’s very likely an extremely motivated Ohio State or Michigan is going to be waiting for them once there. Even with a win, it’s unlikely they’ll have a good enough resume to outrank a one-loss SEC squad or even one-loss Notre Dame. The Canes? For real? Well, not entirely. We’d put the odds of Miami getting into the CFP very, very low. However, it is still entirely possible and here’s how. Obviously, they have to win out, which means defeating Duke, Boston College, and Virginia Tech. That puts them in the ACC Championship against Clemson, who we’ll assume is undefeated and ranked either No. 1 or No. 2 in the nation. If the Hurricanes can somehow pull off the upset, they’ll likely find themselves ranked among the top teams in the nation. Then, if the SEC gets messy, Notre Dame loses once or twice, and no one emerges from the Big 12 like a threat to steal a spot, perhaps it’s Miami who sneaks in there when we least expected it. We know there are more one-loss squads that might garner consideration but we’re going to be honest and just say No. 13 LSU (5-1), No. 14 Florida (5-1), No. 17 Oregon (4-1), No. 18 Kentucky (5-1), Iowa (4-1), Washington State (5-1), and Duke (4-1) are all out of consideration at this point for the CFP. Obviously, LSU and Florida could possibly run the table and do it, but, c’mon now. Sorry, college football is a cruel mistress.